This all started when I accidentally broke one of the new Cree LED light bulbs. The cracks in the shell were visually interesting, but for me the inner workings are far more engaging. 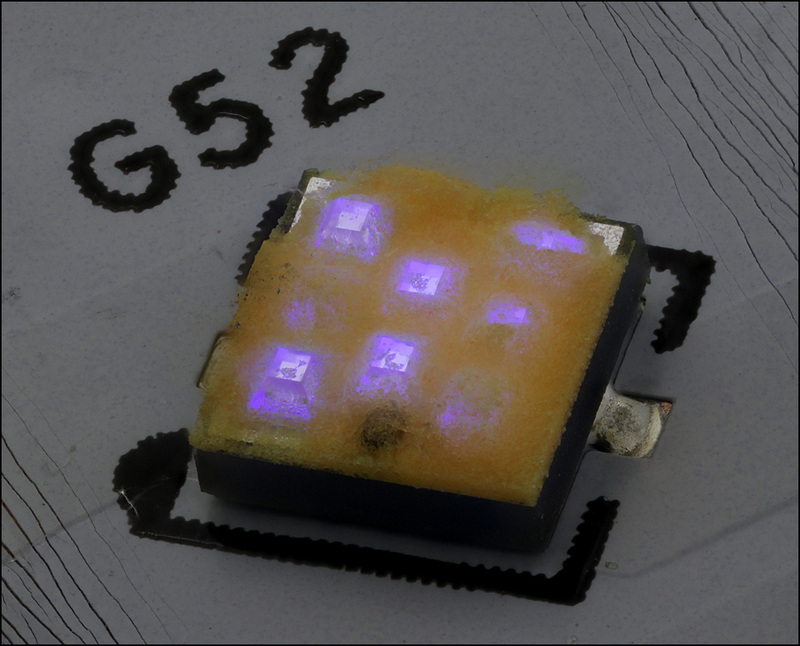 First, here is a single element cleaned of its yellow phosphors, showing 8 tiny LED chips wired in series. This block is about 2.5 mm square. Here is a different element, partially disassembled, this one weakly powered with about 4 µA drive current from a bench power supply. The dark blob below the center two elements is the power delivery post that appears at the top of the preceding picture, here seen mostly buried in yellow phosphor. You can clearly see the distinction between the blue-emitting LED elements and the surrounding phosphors that turn the intense blue into something closer to a normal white balance. Two elements, intact, dimmed with a wall dimmer. Here is an overview of the bulb with and without its shell. Notice that not all the elements have the same color balance. As far as I can tell this is random variation, probably due to differences in thickness of the phosphor layer. Again the bulb was dimmed way down to show some context; at full brightness all that shows is a band of light across the bulb. On the right side you can see half of the 10 light-emitting elements, again all wired in series, making a total of 80 LED junctions at roughly 230 volts DC when the light is powered. Here's the way the manufacturer wants you to think about this technological marvel. Canon T1i camera with MP-E 65 lens. Images 1 and 2 were done with StackShot and Zerene Stacker; the others are all single frames. I was intrigued by your description on your previous thread of the lights being ran in series. These images certainly help me understand the lights construction more. I did some reading on "white" LEDs. There are two types using phosphors to create a white appearance. Some start with blue light and are relatively safe when disassembled. Others use near UV and pose a risk from UV exposure, especially to eyes. Are these the "blue" or the UV type? Are these the "blue" or the UV type? Blue, as far as I can tell. I don't have a near UV detector to check if it sees nothing. But the visible light detectors in my eyes and cameras all report lots of blue present. The second image above gives a misleading impression of the colors involved and I'm not sure why the colors appear as they do. The colors there reflect what I saw through the viewfinder at the time, but they're very different from what I see under other conditions. It seems to be some interaction involving the angle of view and the relatively high level of ambient illumination that leaves the rest of the chip & substrate visible. Here is another image of the same element, shot with my cell phone through a dissecting scope, viewed almost face on, with almost no ambient light. Here is a interesting discussion of the hazard of LED lighting. In this case (disassembled bulb) the hazard is low until the innards are exposed. Our human eye does not recognize how bright the blue LEDs actually are and we may gaze longer than we should at the light. With the low current drive Rik cautiously used, that should not be a problem. Several years ago I did some work with UV LEDs and it resulted in some eye irritation. Happily no permanent damage (I hope!). Thus I am cautious. Thanks for the link to the cautionary article. I agree 100% with the concerns expressed there. 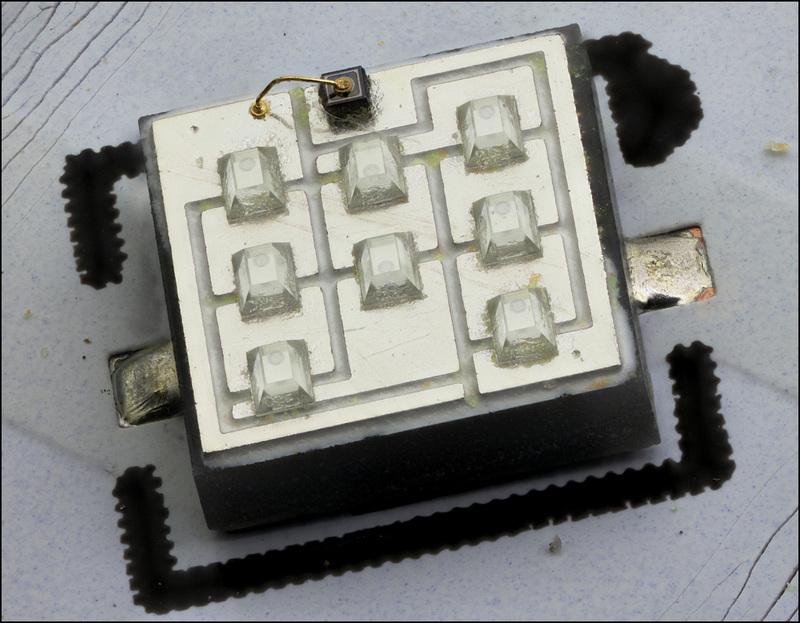 These LEDs are intense -- lots of power coming from a tiny area. 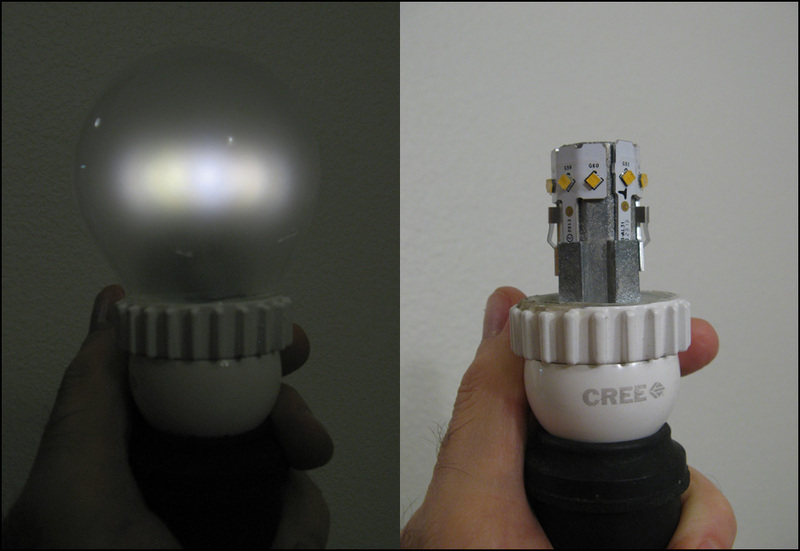 At full power, looking at an intact white-emitting chip in these Cree bulbs feels like looking at the sun. In that case at least you're warned by the large amount of highly visible components. 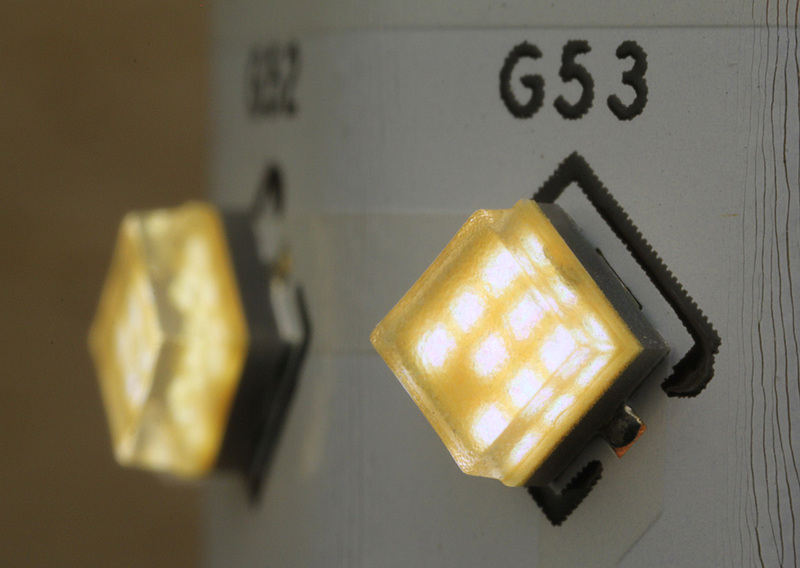 Full powering an element without its yellow phosphors could be a huge risk. Well, I've traced the wiring on the assembly and within the chips, and I've measured ~230 VDC across the full set of them. In the first image here, you can see the un-dotted end of each pyramid connected to the dotted end of another, down the left side, up the middle, then down the right side again. 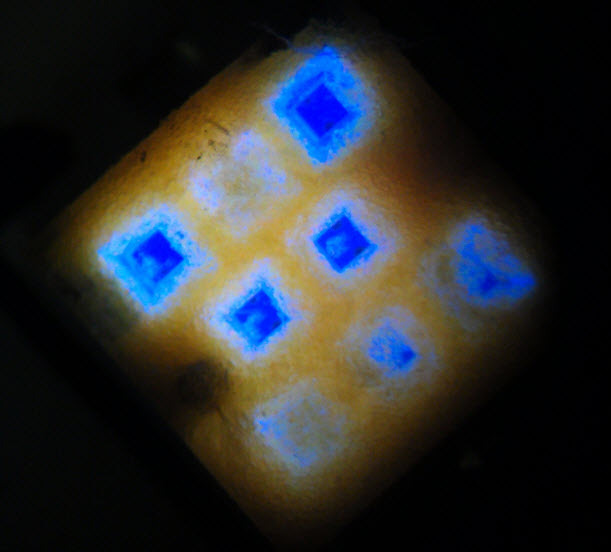 In image #2, it took around 19 VDC to pump 4 µA through the element to photograph it. With respect, they're in series. Initially I was surprised too, based on experience with other multi-chip LED's such as strip lighting. But series makes great sense from a control standpoint because it guarantees that all the LEDs have exactly the same current despite manufacturing variations in the elements. You just have to crank up the voltage pretty high, and that's what they do. 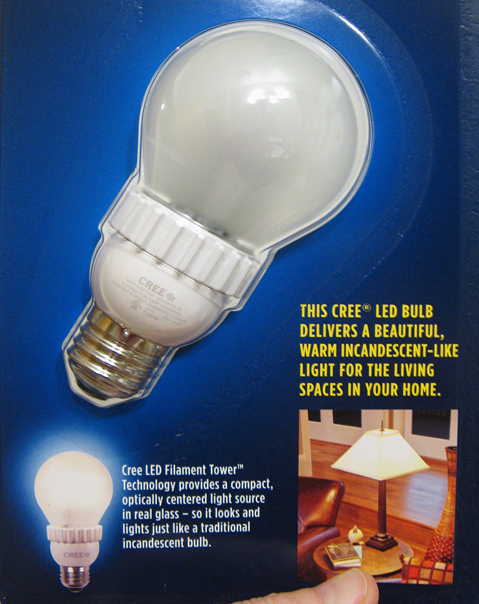 See Exploring a Cree LED light bulb power supply for more discussion. Of course if one LED goes black they all do, but that's just an engineering tradeoff that they bundle into the QA and the guarantee.